Uncovers the hidden world of the military legal system and the intimate history of racism that pervaded the armed forces long after integration. 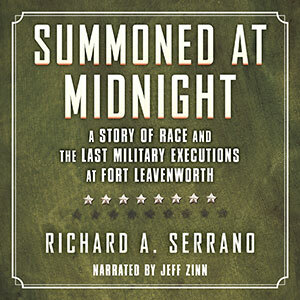 Richard A. Serrano reveals how racial discrimination in the US military criminal justice system determined whose lives mattered and deserved a second chance and whose did not. Between 1955 and 1961, a group of white and black condemned soldiers lived together on death row at Fort Leavenworth military prison. Although convicted of equally heinous crimes, all the white soldiers were eventually paroled and returned to their families, spared by high-ranking army officers, the military courts, sympathetic doctors, highly trained attorneys, the White House staff, or President Eisenhower himself. During the same 6-year period, only black soldiers were hanged. Some were cognitively challenged, others addicted to substances or mentally unbalanced—the same mitigating circumstances that had won white soldiers their death row reprieves. These men lacked the benefits of political connections, expert lawyers, or public support; only their mothers begged fruitlessly for their lives to be spared. By 1960, John Bennett was the youngest black inmate at Fort Leavenworth. His lost battle for clemency was fought between 2 vastly different presidential administrations—Eisenhower’s and Kennedy’s—as the civil rights movement was gaining steam. Drawing on interviews, trial transcripts, and rarely published archival material, Serrano brings to life the characters in this lost history: from desperate mothers and disheartened appeals lawyers, to the prison doctors, psychiatrists, and chaplains. He shines a light on the scandalous legal maneuvering that reached the doors of the White House and the disparity in capital punishment that was cut so strictly along racial lines.